Calling all doggie princesses - this is one of the prettiest doggie sets we've seen! If you're lucky enough to persuade your human to order this item for you you will be the envy of all your pals! 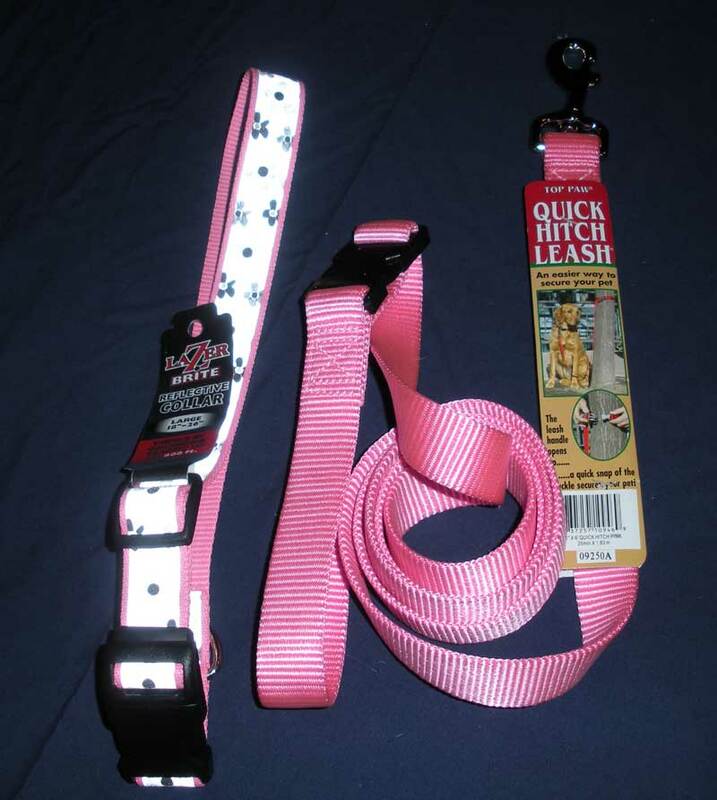 This wonderful auction lot contains one Lazer Bright reflective collar, size 18 - 26" with pink trim. The reflective pattern is silver with a gray and black flower pattern. The collar is packaged with a Top Paw quick hitch leash. Very handy for securing your dog when you dine with her at a sidewalk cafe. Be the belle of the neighbourhood and place a bid on this item today! 1 no: Lazer Bright Reflective Collar, size 18 - 26"
ONLY 1 AVAILABLE - BID NOW (STARTING PRICE $8.00) BY LEAVING YOUR NAME AND BID PRICE IN THE 'POST A COMMENT' SECTION BELOW - AND FEEL FREE TO CONTINUE TO BID SO THAT YOU OUTBID YOUR FELLOW CONTESTANTS!! WE WILL CONTACT THE HIGHEST BIDDER WHEN THE AUCTION CLOSES. Mommy and me will bid $10 green papers on this. It will be pressies for my little sister. HoneyBuzz would like to bid $15 green papers and if she wins, she will donate it to the girl shelter doggies where her mommy volunteers cuz all they have are boy looking leashes and collars! I'd like to raise it to $17, please.